What is cream of tartar? The Food Explainer explains. 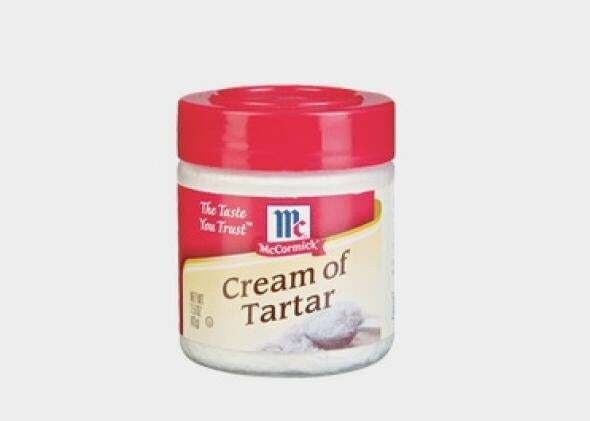 Food Explainer: What’s Cream of Tartar, and Do I Have to Buy It? What is this substance, and why is it in the spice aisle? Cream of tartar, a byproduct of wine and grape juice processing, is an acidic salt that acts as a stabilizer in recipes that require whipped egg whites, such as meringue, angel food cake, and soufflé. When whipped, egg whites (also known as albumen) can swell up to eight times their initial volume. The acidity of cream of tartar helps egg whites achieve their full volume potential, and stabilizes them by helping hold in water and air. Here’s where cream of tartar steps in. Added to the whites before whipping begins (typically at a ratio of ⅛ teaspoon per large egg white), the acidic powder lowers the pH of the albumen. This changes the electrical charge of the proteins, making them more sensitive to denaturation, so the egg whites promptly begin to foam. The cream of tartar also increases the mixture’s hydrogen ions, which prevent the protein molecules from bonding too tightly. With the proteins aligned but not jammed together too tightly, the structure keeps the water and air bubbles in place, and therefore is stronger and more secure. By preventing the proteins from clustering too close together, cream of tartar keeps egg white foam supple and elastic. The albumen’s protein-rich cell walls stretch to their thinnest during baking, resulting in tall, tender-crumbed cakes. Similarly, when a meringue mixture is shaped or piped, or has other ingredients folded in, the acid helps the egg foam maintain its integrity and volume even as it’s squeezed through a nozzle or “cut” with sharp-edged additions like chopped nuts. Cream of tartar also has an effect on baked goods’ color. Angel food cakes made with it are notably whiter than cakes made without. The explanation is twofold: Pigments in flour known as flavones are cream-colored in an alkaline environment but colorless in an acidic mixture, like a batter containing cream of tartar. It’s also a question of perception. Cream of tartar allows egg whites to be whipped for longer without collapsing. This produces small, abundant, evenly distributed air bubbles, which create a fine texture in the finished baked good. When light reflects off a finely grained cake, the cake appears whiter than it would if its texture were coarser. This phenomenon also explains why meringues containing cream of tartar look brighter than meringues without it. As for substitutes, there is no exact equivalent to cream of tartar. Adding ¼ teaspoon lemon juice per egg white will perform a similar function, but it’s less effective than cream of tartar. That’s because any liquid, even a small amount, dilutes the egg white and interferes with the stabilizing action of the acid. Also, while cream of tartar is 100 percent acid, lemon juice is only 3 percent acid, so it’s less potent. Another alternative is to whip your egg whites in a copper bowl. Copper ions, like cream of tartar’s hydrogen ions, keep the protein molecules loosely aligned. However, the copper ions will also impart a rosy hue to the egg foam. Bonus Explainer: Why is cream of tartar sold in the spice aisle instead of with other baking ingredients? Traditionally, spice companies (such as McCormick) process and package it, because it has uses beyond baking. Cream of tartar can be used to help certain types of vegetables keep their natural color when steamed or boiled. Pigments contained in acidic pockets in red cabbage, potatoes, and cauliflower will leach out and discolor at a higher pH. Adding ½ teaspoon of cream of tartar to the cooking water will up the acidity and prevent discoloration. Food Explainer thanks Paula Figoni of Johnson & Wales University, author of How Baking Works, and Luca Zanin of American Tartaric Products Inc.
Why Is Some Deli Meat Iridescent? Why Does Food Taste Better When It’s Browned? Why Does Microwaving Water Result in Such Lousy Tea?